Brean Parish Council is calling on residents, passionate about their community to stand in the local elections in 2019. With annual council tax bills due to land on doormats across Sedgemoor from 11th March, Sedgemoor District Council is warning residents that this is the time of year when scammers can target people. One current scam that has been brought to the district council’s attention is from a company claiming to be called ‘claimers’ who call on behalf of Sedgemoor District Council and ask for £95 to lower your Council Tax banding. Council Tax bands are set by the Valuation Office Agency and can only be changed under certain conditions. Details can be found at www.gov.uk/council-tax-appeals. You will not be charged for the service. Across the country, The National Fraud Authority estimates fraudulent single person discounts cost councils and taxpayers over £92m a year. Continuing the crackdown on fraud, Sedgemoor District Council will be running checks to make sure that people claiming a single person's discount on their council tax bill are claiming legitimately. In Sedgemoor, there are approximately 17,000 people who claim the discount. Sedgemoor District Council is checking by cross-referencing with other sources of information about their household by using sophisticated data matching technology. Fraud investigation is carried out within data protection and GDPR regulations. Currently a 25% discount, ranging from a minimum of £195.25 a year and up to a maximum of £754.25, is given to persons stating they are living in a property on their own. If the checks indicate that another adult is living at the address, the discount will be withdrawn. Residents who are genuinely claiming the discount have nothing to worry about, but anyone found to be deliberately misleading the Council could face a fine and legal action. 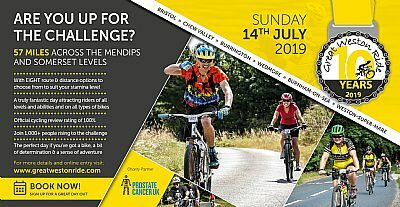 There is an on-line form at https://www.sedgemoor.gov.uk/article/1805/Discounts where people can apply for this discount. Contact numbers for members of the public to report any concerns 0300 303 7801. With the lighter evenings, gardeners are no doubt planning their gardening year ahead and itching to get out into their gardens. Garden Waste collection is a service on offer in Sedgemoor could be blooming useful. 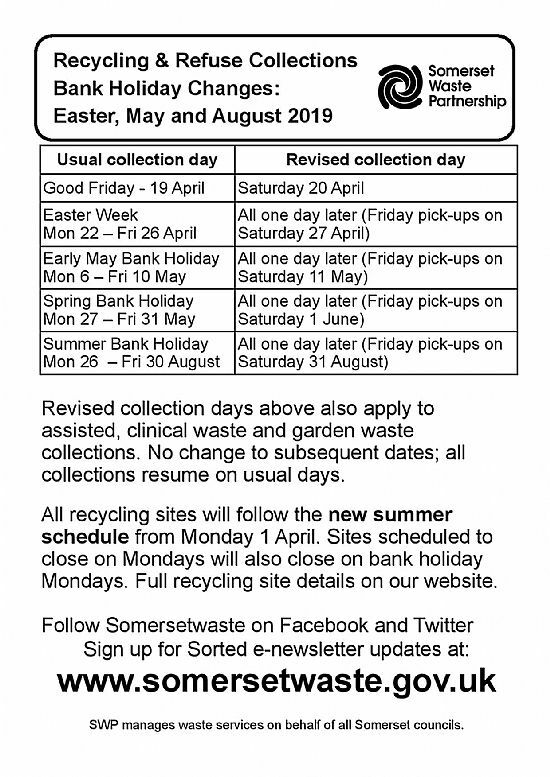 The fast, clean and cheap alternative is a subscription to Sedgemoor District Council's garden waste collection service. You get a roomy wheeled bin that is easy to fill as you walk it around your garden, saving time and energy going back and forth. The bin holds your garden waste neatly in a corner; no more messy piles of leaves blowing in the wind. Wheel your bin outside for the fortnightly collection, leaving you to sit back and smell the roses instead of using fuel and time going to the recycling centre. They collect flowers, plants, grass cuttings, leaves, hedge trimmings, weeds and even branches up to four inches across and compost them in Somerset. Sedgemoor District Council is inviting residents to sign up to garden waste collections in time for the spring. At a cost of £56.90 per year, those signing up to the scheme will receive 25 collections a year. The scheme encourages residents to recycle their garden waste. Customers signing up have the option of receiving a green wheelie bin for their garden waste or garden waste sacks at a cost of £28.40 for 10 bags. Letters are now being sent to more than 10,000 current customers inviting them to renew their subscriptions, which start in April. Customers considering joining up can telephone 0300 303 7800 to order and pay. Having your garden waste collected can save time and fuel and can prevent mess in your car. Every bit of Sedgemoor’s garden waste is turned into Revive soil conditioner. Local parish and district elections are taking place in May 2019 so this is the ideal time to begin to think about getting involved. Have you ever thought about standing for election as a Brean Parish Councillor or Sedgemoor District Council Councillor? 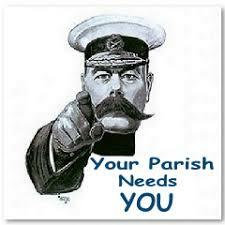 With the local parish and district elections taking place in 2019 this is the ideal time to begin to think about getting involved. Anyone can be a councillor. Your background, qualifications and occupation are not important. All that matters is that you have a keen interest in your local community, can spare some time and are passionate about making a difference in Brean. Support is available to help people carry out their duties and a financial allowance (as a district councillor only) is payable to meet costs incurred. Find local, trustworthy businesses through the Buy With Confidence scheme. All businesses in the scheme are vetted, approved and monitored by Trading Standards. Visit buywithconfidence.gov.uk or call 01392 383430.